In India, sedans are perceived as a status symbol, but due to heavy price tags masses never opt for these flashy rides. However, things took a turn when Indian government announced a subsidy on cars under 4-meter and manufacturers like Tata and Maruti Suzuki came up with cars such as Indica CS and Swift Dzire. Today, compact sedans are one of the leading segments in the Indian market. At an early stage, compact sedans were just premium hatchbacks with a notchy boot. However, as the segment is performing well, manufacturers started developing these cars from scratch. These cars still share platform with their hatch siblings. But now these come with more sedan like characteristics. In fact, compact sedans are outperforming their hatch sibling in sales volumes as well. So, if you are looking for an affordable comfortable drive for your daily commutes, the compact sedans perfectly fit in the bill. As the festive season is in full swing, this is possibly the best time to buy one. Let’s explore the options available in the market. The best-seller of the segment, MSI sells Swift Dzire as hot cakes. Brand name, best after sales, reliable performance, frugal and refined engines make Dzire an obvious choice of almost 18,000 Indians every month. Swift Dzire is available with a choice of two engines- 1.3-litre Multijet DDiS diesel engine which develops maximum power output of 74bhp and returns fuel economy of 23.4kmpl. The 1.2-litre K-series petrol engine churns out maximum power output of 86bhp and returns mileage of 17.6kmpl. Both the engines are refined and with Dzire’s unmatched ride quality, these make a lethal combination. Swift Dzire is a well packaged car, but most of the features like alloy wheels, climate control, integrated music system, ABS, Airbags, etc are offered with top-end ZXI/ZDI variant. However, Dzire comes with an impressive cabin, the color scheme provides it an airy feel and fit & finish is also at a par with segment standards. Available in a range of Rs. 4.80 lakh to Rs. 7.30 lakh, Swift Dzire comes with quite competitive price tag. Maruti Suzuki India is offering Rs. 25,000 discount (Rs. 5000 gift voucher + Rs. 20,000) on this popular offering. Honda Amaze have been a very special car for Honda, as it is the first diesel car by Honda in India. After City, Amaze is the second biggest success of Honda in the country. Based on Honda Brio’s platform, Amaze comes with the 1.5-liter i-DTEC diesel and 1.2-litre i-VTEC petrol engine. The diesel engine puts impressive 98.6bhp and returns fuel economy of 25.8kmpl. Making Amaze, the most powerful and frugal car in the segment. The petrol engine builds 86.7bhp and returns fuel economy of 18.0kmpl. Both the engines are peppy and love to be revved, however the all aluminum diesel engine is a bit noisy than the rest of the lot. Amaze has an impressive ride quality at both urban roads and highways. Amaze has a mature styling than the Dzire and it doesn’t look quirky from any angle. However, as it carries the interior cues from the Brio, its dashboard is not at par with the Dzire or Zest. However, the Amaze comes with features like ABS and Airbags, alloy wheels, integrated music system, though it misses 15-inch wheels even in the top-end trims. Available in a price bracket of Rs. 5.0 lakh to Rs. 8.2 lakh, the Amaze is certainly a good choice. Being a Honda, it surely provides you a status and a pride ride for sure. 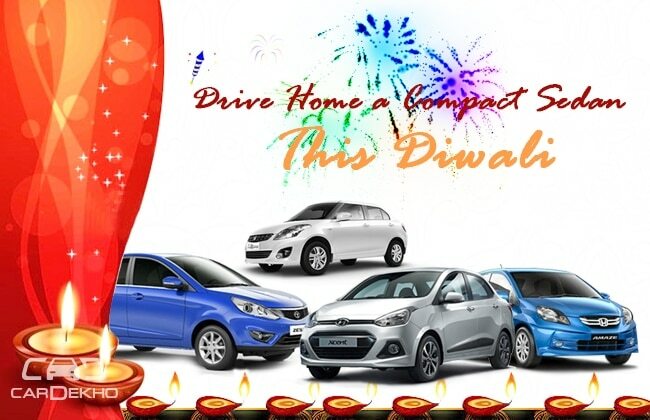 Honda is not offering any discount on Amaze this Diwali. The South Korean brand is known for its flamboyant designs and plush interior schemes. When the company decided to step into the fierce compact sedan segment, we were not expecting anything lesser from them. Hyundai does stand true on our expectation and brought the Xcent. The Xcent is based on the Grand i10 and available with a 1.2-litre Kappa2 petrol and 1.1-litre CRDI diesel engine. The 1.1-litre 3 cylinder diesel engine churns out a maximum power output of 71bhp and returns mileage of 24.4 kmpl. The proven and potent 1.2-litre Kappa2 petrol engine develops 81.5 bhp and provides a fuel economy of 18.6kmpl. Despite being a 3 cylinder engine, the 1.1-litre diesel engine is smooth and refined and the already quite popular 1.2-litre Kappa2 engine feels even smoother in the Xcent. The Xcent is the best compact sedan to drive in city traffic as its light and nimble handling make heavy traffic driving a boon. However, the highway performance is not at par with the other competitors as it doesn’t feel confident on high speeds. On outside, the Xcent looks well proportioned as it has been designed from scratch. The Xcent carries the cabin from Grand i10, though it is plush and additions like automatic AC and rear AC vents makes it more comfortable. The top-end trims come with diamond cut alloy wheels, integrated music system with 1GB memory, ABS, airbags, etc. Hyundai Xcent is a good choice if you want a car to commute daily as it has impressive city ride. The car is available in a range of Rs. 4.8 lakh to Rs. 7.2 lakh. Hyundai is offering a discount of Rs. 8000 Cash + 10,000 Exchange + 1 Gram Gold Coin on the diesel variants, though there won’t be any discount on the petrol trim. Tata Zest is the latest offering from the home grown manufacturer and it is undoubtedly the best shot from Tata in recent times. The car is being offered with newly developed 1.2-litre Revotron petrol and 1.3-litre Multijet engine. The 1.3-litre Multijet of Zest comes with two different power options- 74bhp and 89bhp and returns a mileage of 23kmpl. The 1.2-litre Revotron engine is first turbocharged engine, which develops maximum power output of 88.8bhp and comes with three different driving modes namely Eco, City and Sport. Tata Zest performs well with both the diesel and petrol engines; however petrol engine is more versatile due to different drive modes provided. The Zest is also the only diesel car in the segment, which comes with AMT (Automatic Manual Transmission) making city drive a boon. The Zest has a refreshed designed and has a good road presence. It comes with a well designed cabin and everything has been designed to add to its premium appeal. Tata has bestowed the car with first in segment features like Projector headlamps, a 5-inch touchscreen infotainment system and features like turn indicators integrated with ORVMs and 15-inch alloy wheels as standard. Available in a price range of Rs. 4.60 lakh to Rs. 7.0 lakh, Zest is one of the most affordable cars in the segment and the features that you get in this price makes it a value for money car. Apart from this Tata is offering 3 year maintenance + 3 year road side assistance + 3 year warranty, which is icing on the cake.